ARTISTIC BUTTERFLY FLOOR MAT home decor, jewelry, decor, decorations, electronics, fountains, floor mats, art glass, vases, garden essentials, fireplace screens. 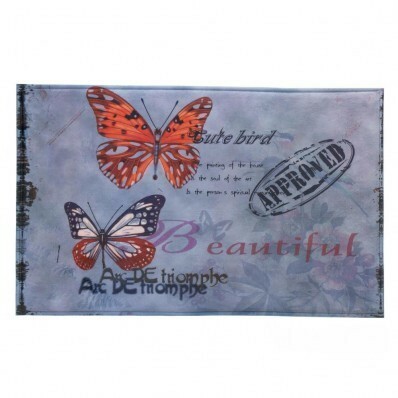 Butterflies and flowers, stamps and words, all come together beautifully in this artistic floor mat. The memory foam construction makes it as comfortable as it is pretty. Machine wash cold; do not bleach; do not tumble dry; cool iron. Do not dry clean. Material(s): POLYESTER POLYURETHANE MEMORY FOAM FELT. Dimensions 31.5" x 19.8" x 0".